By Sean McDaniel: Former WBA heavyweight champion David Haye (25-2, 23 KO’s) has the perfect opponent to fight the tune-up fight that the Klitschkos would like for him to fight before one of them will agree to fight him again. Bernard Hopkins, 46, who was totally disgusted with Haye’s pathetic effort in losing to IBF/WBO heavyweight champion Wladimir Klitschko recently, took the opportunity to call Haye out for a fight and even acknowledged that Haye would have a 20 pound weight advantage over him in this fight. Hopkins doesn’t care, and also doesn’t care that he’s 15 years older than Haye. Hopkins isn’t afraid of Haye is willing to be the smaller guy. Thus far, Haye hasn’t said a word about the challenge, but it seems to be it’s a great fight for Haye. A bout between Haye and Hopkins would be a big deal in the United States and would draw well if it takes place in Las Vegas, Nevada. You could even put in England and it would do well, even though Haye’s last two fights that have been shown on Sky PPV have not been pleasing fights. Haye does well against smaller fighters or ones his own size. Hopkins is an inch shorter than Haye and weighs little more than 190. A win for Haye against Hopkins would be the perfect warm up bout for Wladimir or Vitali Klitschko. Of course, if Haye gets beaten by Hopkins it would ruin everything, but you got to take risks if you want to earn the right to fight the Klitschkos. Haye needs to take a big risk to make boxing fans forget how awful he looked in stinking out the joint against Wladimir in Germany. 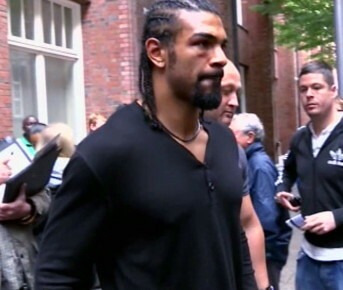 Haye needs to punish himself and take the fight.